While working with different teams, noticed that there are teams(not many) who want to use af:inputComboboxListOfValues without using ADF model. If you have such use cases, then this post is for you. This post contains a sample for programmatically populated af:inputComboboxListOfValues component, without using ADF model. In fact the core pieces used in this example are copied from ADF Faces demo source. This sample is useful if you use ADF Faces without ADF model(binding layer) and still want to implement ComboboxLOV. 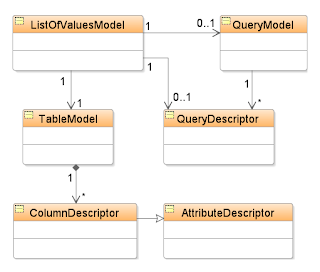 The following diagram( Also see similar discussion in Oracle® Fusion Middleware Web User Interface Developer's Guide) illustrates ListOfValuesModelthe model class used by the LOV component. In this diagram, you can also see it's association with the QueryModel and TableModel classes, which are used by the LOV UI component. For example, consider the Department and Employee hierarchies built using the Department and Employee view objects, linked through a view link. You can build a composite view object at runtime by combining these two view objects as shown in the following code snippet. 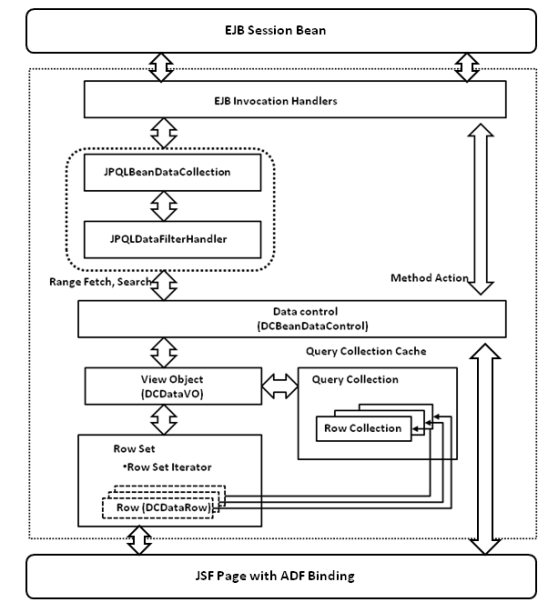 This feature is explained in the Appendix of the book Oracle ADF Real World Developer’s Guide. You are free to download the Appendix from packtpub site.Yes, its absolutely free !! !